This book provides an up-to-date critical analysis of the integration of environmental policies into US free trade agreements. The work focuses on the evolution of the design of environmental policies and analyzes their effectiveness. Starting with the North American Free Trade Agreement (NAFTA) leading to the Trans-Pacific Partnership (TPP), the book examines the history of policy integration. In doing so, it provides an overview of the major trade-related environmental policies and presents empirical research on their effectiveness, a discussion of the continued demand for policy integration in light of the effectiveness, and recommendations for addressing shortcomings. The main objective of the book is to inform the ongoing policy debate over integration of environmental policies into trade agreements. The current renegotiation of NAFTA provides an opportune time for undertaking this critical review of trade-related environmental policies. 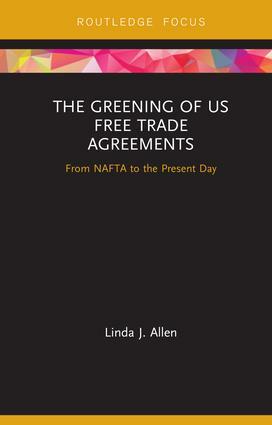 As our understanding and knowledge of the environmental policies associated with US trade agreements, in particular for NAFTA, has grown significantly over the past twenty-five years, this book provides a timely and critical update for this policy debate. Students and scholars of environmental law, trade and economics, and specifically US trade, environmental policy and law will find this book of great interest. Linda J. Allen is an Adjunct Instructor in the School of Science, Technology, Engineering, and Math at American Public University System, USA. She served as a AAAS Diplomacy Fellow at the US Department of State from 2003 to 2005, and was a member of the US delegation to negotiate the environmental policies for the then Andean Free Trade Agreement.